Edd Moore provided me with the measurements. Also, I went over to the Dickson County Tennessee Airport and made some templates with cardboard. I thank all of you for your help. I have what I need to get on with it. I will provide all with information on the completed project and how well it works. Steve, I investigate the possibility of using something already in use as not to reinvent the wheel but would not work with the coupe. Again thanks to all! Make that the big chill - not shill! Billy has any responded yet? If not, I'll try to get but storm due in today. 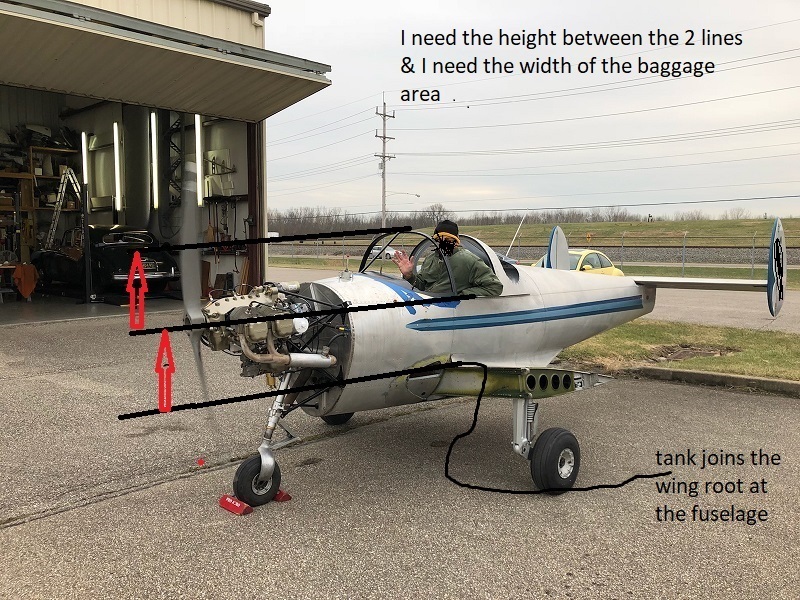 My guess is that some measurements may differ due to tire pressure, models, early/ late landing gear etc I have plum bob, etc so can come close - maybe others will support and you can compare. I need some measurements for the aircoupe. I am designing a handicap lift to transfer my quadriplegic wife from her chair on the ground and place her in the right side seat. (1st): I need the height from the ground to the top of the wing where the rear of the fuel tank joins the wing root against the fuselage. (2nd): The distance from that same point on the wing root to the bottom of the window pocket. Where you would rest your elbow when flying with the window open. (3rd): The height from the location described on the 2nd point to the top of the canopy. (4th) The width of the baggage area behind the seat. I will attach a picture showing the measurement locations. I do not have the aircraft yet and want to get started on the design for the lift. It will NOT be permanently attached at any location but will have a clamping system which will be removed and the lift stored in the baggage area. This system will mitigate the need for a right side door modification and a lengthy FAA approval process. Last edit: 21 Jan 2019 13:22 by BILLY REEVES.